Exercise doesn’t have to be complicated, intimidating or even time consuming-as it is often portrayed. However there are wrong ways to do it, so make sure the effort you give is benefiting your well-being and not harming your body. Walking is a very underrated but simple way to jump into exercise at any age. If walking is not something you do regularly I encourage you to visit the links provided, as they can express the benefits of walking in far greater and more exciting detail than I can. The average American spends roughly 9-12 hours of their day sitting down, depending on his/her occupation. Research shows that getting up regularly to walk around has significant health benefits, however regular walking can be tricky when you’re at work. After work is okay too folks! Exercise is exercise whether it is before, during or after your work day- try to fit it in somewhere. Dedicating time outside of work to walking means you will most likely have a longer period of time available to work with, which is better! A half an hour is 2% of your 24 hour day. 2% is all it takes to start improving your sleep and circulation, support your joint health, and decrease your risk of developing a serious health issue such as coronary heart disease or type II diabetes. 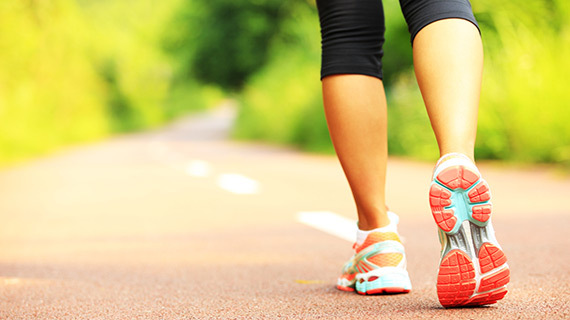 The health benefits from a mere 30 minutes of daily walking are tremendous, but you should experience that for yourself. Studies show that it takes 21 days to make a behavior a habit, and 90 days to make it a lifestyle. Keep a daily walking journal for either amount of time and log how it personally benefits your life-we’d love to hear how it goes! Asbury Woods provides the perfect location for a daytime stroll. This local opportunity allows you to pick from several different trails to find the perfect length and scenery for your personal liking (trail maps attached.) This way you can shake up the scenery and walking everyday won’t seem like such a chore, but more like the privilege that it is.